I’m old school cool. Real hackers chat on open, distributed platforms. Most technical discussion can be found on the Freenode IRC network. It’s not perfect, but the advantages clearly outweigh the drawbacks. Recently, I needed to join an existing large “community” on the centralized, proprietary walled garden that is the Slack network. 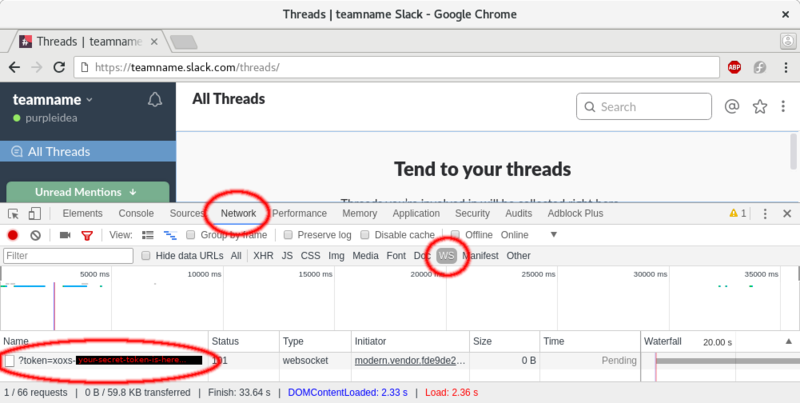 Connecting to the the Slack server requires that you use either the proprietary client or their proprietary web app. There’s zero chance I will install the former on my machine, and the latter uses an absurd amount of browser memory and CPU. I’m already happy with my irssi experience, and I didn’t want to need another app. Initially, Slack offered an IRC bridge as part of its embrace, extend, and extinguish strategy, but this is now closed. Don’t use Slack! Move your team to Freenode or run your own private IRC server. This lets everyone use the client of their choice on the platform of their choice. Luckily there’s a workaround if you need to infiltrate an existing Slack community. ;) Here’s how I did it. Log into Slack via the web browser and get a “legacy token”. You can get one from this web page. Apparently an administrator needs to allow this per-user, but since nobdy was responsive, user 42wim pointed out that you could just sniff for the token being used in the web ui. Do this with care, since I have no idea how to revoke this token if it is lost. Perhaps changing your password will cause it to change, but I haven’t tested it. Nobody knows how long this token will last, but if things stop working you know how to go find it again. Now we need to run a small local IRC server which speaks Slack protocol, and maps this to the standard IRC protocol that your IRC client will understand. There are three projects I’ve found that do this. I experienced a number of crashes with wim promptly fixed, and I think things are now pretty stable. I’m currently running a git version: a0ab000e02cfaedc136acd1da34afacdb7bf1791. If you find any issues, wim has been very responsive in fixing them. You could probably add a systemd service for this, but I didn’t bother. In the above blocks you’ll naturally want to replace teamname with the name you’d like to give to this slack network. You’ll also need to replace the xoxs-your-secret-token-is-here... string with the value that you found in part 1. 06:50 [teamname] -!- End of /MOTD command. You can now join more channels and even direct message other users. The complete list of users should show up in a special &users channel. Most things work as expected. Some IRC clients (apparently Pidgin) convert a window close action into a Slack channel leave action. If that was an invite-only channel, you might need to be re-invited in order to re-join. As I write this article, wim has added automatic token fetching to matterircd v0.18.0. I haven’t tested it, but if you’d rather use your password directly, this looks like it should do it. You’d probably want to replace the use of the token in the password = "xoxs-your-secret-token-is-here..."; line with your actual password. Hope you enjoyed this. Tell your friends to pick regular IRC instead. You can support James on Patreon if you'd like to help sustain this kind of content.